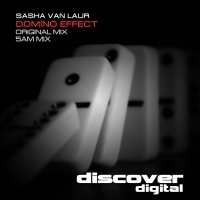 Sasha Van Laur delivers a double header for Discover with Domino Effect. The Original Mix is a stunning off beat bass trancer that moves through the gears at speed building sonic layers as it goes until the breakdown which washes over you with lush textures and hypnotic plucks. The 5AM Mix strips the original back to the bare bones for those moments 5AM club moments when less is more but you can't leave the floor. 'Domino Effect' is available now from Beatport and iTunes.